Bishop Chatard High School prepares its students for college now, heaven later. Academic excellence supported by faith formation creates a unique learning environment to nurture development of the whole person. A robust student life program challenges every student, beginning in the freshman year, to try new things. We recognize that no two students are the same, and our teachers and administrators strive to make the Bishop Chatard experience as unique as each individual. Young people are encouraged to be who they truly are, while also spending time learning who God is calling them to be. Year-after-year, Bishop Chatard is the high school chosen most often by North Deanery families. Bishop Chatard students are supported by over 50 years of history and tradition. Committed to our role as the Archdiocese of Indianapolis North Deanery high school, it remains the mission of Bishop Chatard to serve all students who seek a Catholic education. We achieve that by maintaining an inclusive learning environment that offers over 50 Honors, Advanced Placement and Dual Credit courses along with an innovative Academic Support Program that narrows learning gaps. Trojans graduate college-ready. Bishop Chatard’s 13:1 student-to-teacher ratio and individualized guidance program prepares students for study at some of the most challenging and innovative post-secondary institutions in the country. The Class of 2017 averaged nearly $160,000 per student in scholarships and grants, and over 70 percent of these young men and woman earned Academic Honors diplomas. 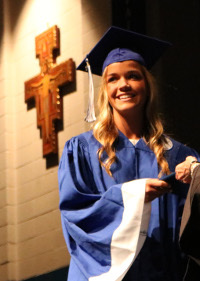 When they begin college, the majority of Bishop Chatard graduates do so with the momentum of having earned course credits in AP and Dual Credit classes taken while in high school.